Shortly after the first reports on social media, the police denied an accident had taken place, saying there were no official reports of it. The two military armored personal carriers (APCs) apparently broke down. 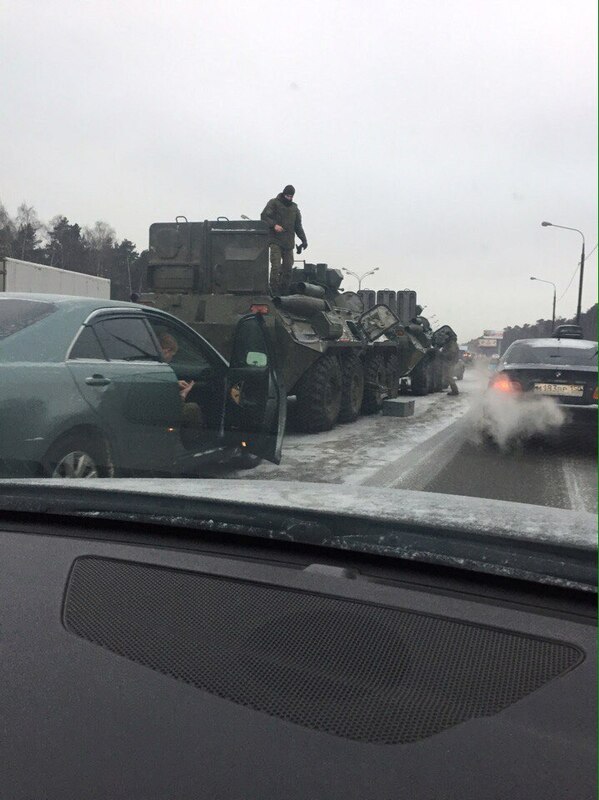 A road incident today involving two military armored personal carriers (APCs) has caused traffic havoc on the Moscow Ring Road (MKAD) just south of Russia’s capital. Pictures shared by eyewitnesses on the Vkontakte social network apparently show an armored vehicle in an accident with a Toyota Camry. Traffic police, however, say that the incident was not an accident, but that the APCs had technical problems and broke down, reported (in Russian) Rossiyskaya Gazaeta. Vkontake users posted photographs showing the two APCs, and in front of them are police cars with flashing lights. The Toyota Camry is parked closely behind the APCs. Shortly after the first reports on social media, the police denied an accident had taken place, saying there were no official reports of it. Gazeta.ru reported (in Russian) that the Toyota didn’t collide with the APCs, but was instead carrying parts necessary to repair them. After the repairs, which were supervised by traffic police, the APCs and the Toyota went on their way.